Struffoli! Strew-foal-e are some awesome little marble sized honey balls of delight! Oh yes, they’re sticky! But that’s part of the fun! 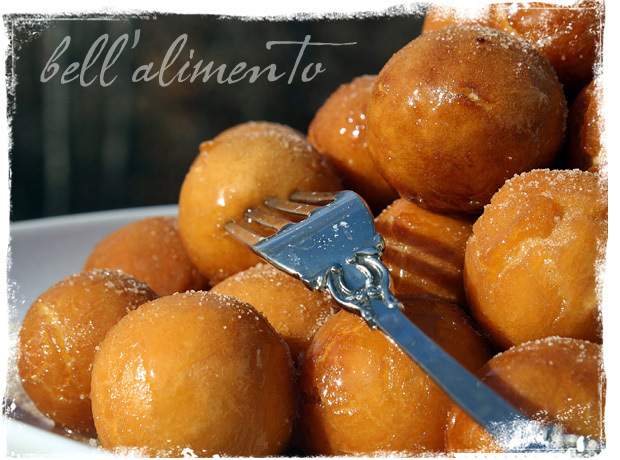 Struffoli are a Neapolitan Dessert typically found around Christmas & Easter! You normally find them in either the shape of a wreath or a cone like tree or well mound if they won’t stand up. LOL Either way, they’re going to be delicious! Normally I’d sprinkle them with festive happy little sprinkles (because well sprinkles just scream HAPPY!, but alas we had used all my sprinkles up on sugar cookies *sigh*) If you’re feeling froggy, you can also add lemon zest or candied orange peel in as well! Frying these babies can be a little tricky! Here’s the deal when frying the dough you HAVE TO KEEP IT AT the same temperature. I use my candy thermometer so I’m not guessing. Why you ask? WELL if your oil is too hot then it’s going to brown much too fast on the outside & not cook on the inside. Leaving you with what appears to be a burnt looking hush puppy & raw dough on the inside (I’m not going to say how I know this but trust me LOL). Not what we’re going for! & well if the oil is not hot enough then it’s going to be extremely greasy and just plain yuck. Start out just frying a few at a time until you get your groove. I, of course, am insanely jealous of Mrs. Paula Deen’s deep fryer in her kitchen that I’m sure would fry all of these balls in no time flat. Ah, dare to dream! Have you seen that thing? So cool. Into your mixing bowl add the flour, baking powder & salt and mix to combine. Create a well in the bottom and add your eggs, sugar & vanilla extract and mix on low with your paddle attachment until well combined and a dough has formed. If dough is too sticky add a little flour. Allow your dough to rest for approx 10-15 mins. Add the oil to deep sided pan and heat to 350 degrees. WHILE oil is heating. Roll out your dough onto a lightly floured surface into strands and then cut them into roughly 1″ pieces. With floured hands, roll each piece into a ball (about the size of a large marble). Continue until all dough is formed into balls. In a separate pan add your honey & heat over low heat until honey is melted. Add the cooked dough balls & coat well with honey. CAREFULLY Transfer coated honey balls to your serving tray. Arrange them in either a wreath shape or a cone shape (tree like). Generously sprinkle with Cinnamon Sugar or Sprinkles. These do look delightful and I’m with you on the deep fryer – that would make it a lot easier but who has the room that?!? Thanks Amy! Yes, kitchen space is a hot commodity! Yum! These look wonderful. I am with you on using the candy thermometer… I use it anytime I fry anything. It’s the only way I know to ensure that the oil stays at the right temp. i totally know abt the oil temperature part coz i some how manage to burn the first few ..lol!! Your honey balls look so yummy Paula! I have a recipe as well but with Walnuts sprinkled in, love these!!! Ciao Diana! Walnuts blended in sound delicious! I have a friend from Salerno who used to make these but it’s been years since she’s done it. You’re making me want some of those right now. Ah, thanks Linda! So glad I could conjure up some wonderful food memories! 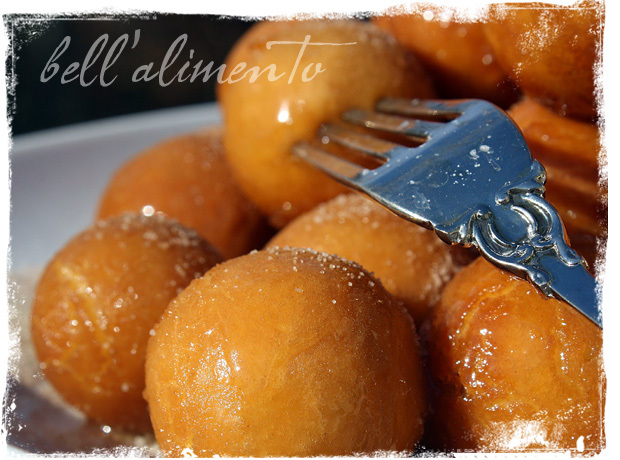 I love Struffoli. Yours look delicious! mmh. what a perfect christmas morning breakfast. wonderful! Yes, Christmas morning breakfast with a warm cup of cappucino is our traditional holiday breakfast. My Neapolitan wife and relatives always made struffoli on Christmas Eve. and they made enough to last through New Year’s morning as well, as long as we didn’t finish them long befrore that day. Plus we add lemon zest to the dough. Another tradition is to buy Panettones for holiday desserts as well, but struffoli is our favorite. Enjoy! 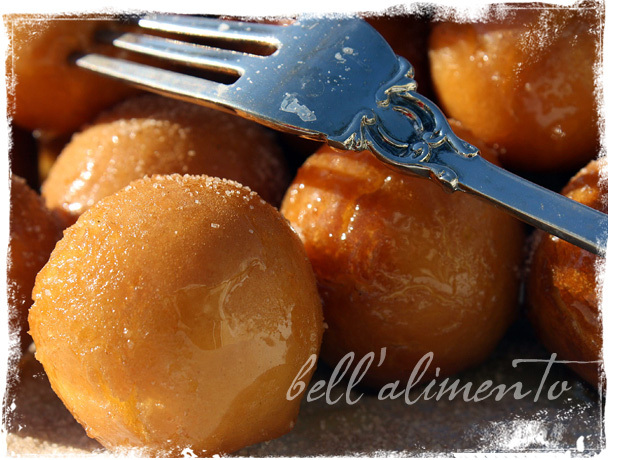 What tasty & very inviting honey balls,…they look fantastic!! Thanks a bunch Sophie! They’re pretty hard to resist, they’re so little though that you don’t feel TOO bad about eating a dozen of them LOL! Thank you for posting this recipe. Every Christmas my mom would set aside a weekend to make struffoli, pan dulce and English toffee for the holidays. I’m not sure how many batches of struffoli dough she would make, but near the end of the evening, my Dad and I, growing more tired by the minute and still rolling the dough at the kitchen table, knew they were closer to ovals than the round balls they started out as. Sadly, my sister kept all of the recipes to herself and refused to share them. These little honey balls were the highlight of Christmas all through my childhood and I am finally going to share them with my own daughters. Thank you so much and Merry Christmas to you and yours. I have seen many receipes for this with zest of orange and lemon also some anise, are those necessary?